Yvonne Wende wins 2nd place as entrepreneur of the year! 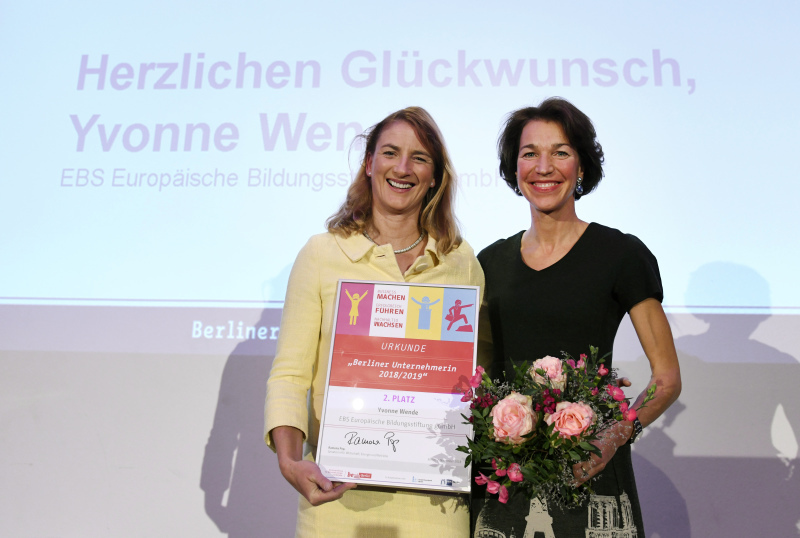 Yvonne Wende, Founder and Managing Director of Berlin Cosmopolitan School (EBS gGmbH) was awarded second place as “Berlin Entrepreneur of the Year 2018/19” on Friday, 2 November. This title was awarded for the eighth time and the winners were honoured by Economics Senator Ramona Pop (Green Party). First place went to Milena Glimbovski (Original Unverpackt) and Constanze Buchheim (i-potentials) third. Congratulations to Yvonne Wende for this special award and congratulations to all three Berlin entrepreneurs of the year! Posted in Invalidenstrasse, News, Primary, Rückerstrasse, Secondary, Top.